Winches are very useful when loading broken down vehicles onto a car trailer, however it is important that all safety measures are carried out correctly to avoid damage or injury. Ensure the trailer is safely connected to the towing vehicle prior to operating the winch to prevent the trailer from rolling away. Only load vehicles onto and off of a trailer on a flat, sealed surface, ensuring the towing vehicle is in park with the handbrake on. If required, chock the towing vehicles wheels for added safety to prevent any movement. Open the winches safety latch and lock it into the open position. Pull the winch strap out towards the trailer ramps. (Watch out for spinning handle). Inspect the winch strap prior to use to check for excessive ware or fraying. Attach the winch strap to approved tow points on the vehicle only. Never stand behind a vehicle that is being winched onto a car trailer as the strap may fail at any time. Release the safety catch so that you can hear a clicking sound as you wind the winch in. Keep the winch strap centred and ensure the vehicle is loaded in the center of the trailer. Never wear lose clothing when using the winch as it may become caught in the cogs. 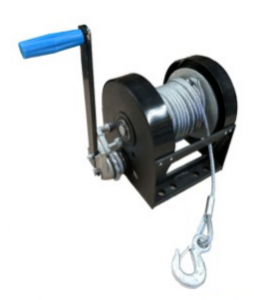 Note: The winch is designed to pull vehicles on to the trailer only and not to be used for unloading or for securing the vehicle to the trailer during travel.